Come and visit our booth at ICORS! ICORS is the place where all major developments of the broad field of Raman spectroscopy will be presented and discussed. Ranging from ultra short and ultra small techniques to applications in life sciences to geology the conference provides a platform for in-depth scientific discussions of all major topics related to Raman spectroscopy. Come to visit our booth at ICORS, Jena, Germany!Come to our booth and see the NEW! 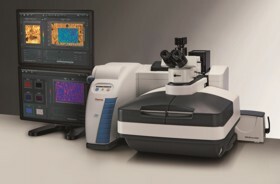 Thermo Scientific™ DXR™xi Raman imaging microscope which enables users across many disciplines to quickly create information-rich chemical images without Raman expertise or a deep learning curve. It features a microscopy-first design that uses image-centric operation and built in spectroscopic profiling..